Netflix’s will become less dominant in western European SVOD over the next five years as Amazon launches across the region and takes share from the market leader, according to new research. Digital TV Research estimates that Amazon will launch its full Prime Video streaming service in 15 western European territories by end-2017. As its regional SVOD footprint expands, its market share will increase from 14% in 2015 to 21% by 2021. Amazon currently has its streaming service in the UK and Germany in western Europe. It was widely tipped to use the launch of mega-budget motoring series The Grand Tour as a platform for a slew of international rollouts. It is making the series available around the world but has not, however, launched the full Prime Video service globally. New launches will see Amazon chip away at Netflix’s market leading position in western Europe, but the latter will remain the largest SVOD player by some distance. 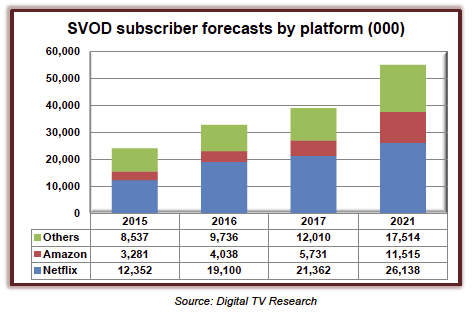 The overall number of SVOD subs in the region will rocket from 24.2 million in 2015 to 32.9 million at end-2016 and 55.2 million in 2021. Western European SVOD revenues will total $5.87 billion by 2021 – up from $2.15 billion in 2015. The UK will remain the SVOD revenue leader – generating more than Germany and France combined in 2021.